People talk a blue streak about Lena Dunham‘s Girls, but Enlightened has a deeper grasp of the world, including the problems of anti-corporate activism. Girls is going to dominate the discussion of television tomorrow, Golden Globes be damned, but a small but loyal band of people like myself are not looking forward so much to the return of Girls as we are to the same of Enlightened. HBO is trying to boost Enlightened’s anemic ratings by pairing it with Girls (whose ratings are better, if not as stratospheric as one might expect given the breathless coverage), and please God let us hope it works. 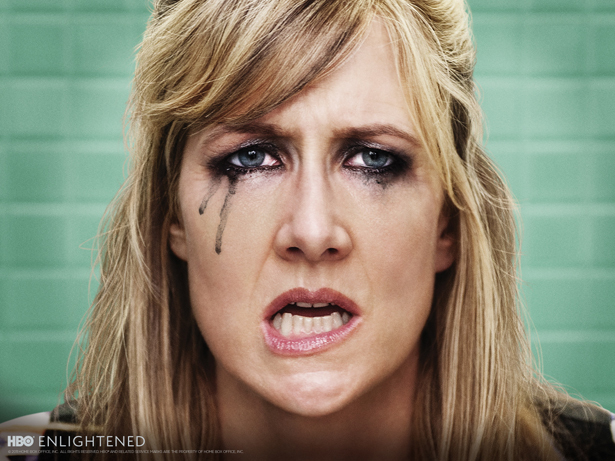 Enlightened is one of the few strokes of real, original storytelling left in prestige television right now, which is clogged with high-minded but philosophically empty, spectacle-bloat vanity projects like Boardwalk Empire, Game of Thrones and, yes, even Mad Men’s later seasons. Also, for the leftists in us, it has a nice anti-corporate bent as a bonus prize. Enlightened, for the uninitiated, stars Laura Dern as Amy Jellicoe, a woman who, in short, cracked up at the beginning of the first season over a workplace affair. She sent herself off to Hawaii to recover, returning with a new, Buddhist-inflected attitude about life, and a $25,000 treatment bill. So she has little choice but to return to the scene of the crime, and through a well-timed threat of a harassment suit, manages to force the company to give her a position. But she’s relegated to a new department, a basement in which the company is developing a kind of productivity software that will allow bosses to hound employees over every dilatory second of the day. In the first season, Amy became a sort of frog willing to jump out of this pot of hot water. Her motives are both self-serving (she would like a better job) and not (she has become convinced that the company’s business model). Season two is to trace her life as a corporate whistleblower. The show is the creation of Mike White, a writer who isn’t yet a household name but whose style—as both a writer and an actor—is impossible to confuse with anyone else’s. Watch his movies Chuck & Buck or Year of the Dog and you will see, instantly, what I mean. The comedy of it, to the extent it even is a comedy, exists in moments of discomfort. That makes White sound like a British comedian, but he’s more full-hearted than someone like, say, Ricky Gervais. White’s style suggests a cynic who is not sure he should be a cynic, but also an idealist who doesn’t know he’s an idealist. In other words, there’s always this tension in the heart of what he’s doing, something that is not so much self-doubt as it is self-questioning. Even the title is meant to convey that: Is Amy enlightened? It’s mostly hard to tell. This can make the show something of an acquired taste. A couple of friends I’ve recommended it to come back confused. Are they supposed to “like” Amy? Sometimes she has tantrums; sometimes her social skills are off. She doesn’t really obey the conventions of melodrama, in seeming neither tragic nor heroic in her crusades. And in that she is actually more like a real human being, really trying to Do The Right Thing by her family, by her friends, and by the world, and finding that in fact the path to doing just that is not as clear as it seems. Oddly, that suddenly makes the show much like Girls, doesn’t it? But Hannah Horvath and Amy are very different people. “The Right Thing” is not of any concern to Girls. The world outside Hannah and her friends barely exists for them, and while Girls does poke fun at that, it also doesn’t present any alternative viewpoint. Enlightened’s Amy was once, it seems, more like this, more wrapped up in her own life, and less prone to consider people outside her immediate vicinity. The show is about her process of opening herself up, one which runs in a less-than-ruler-straight line. It’s a tiresome trope to hold a television character up as a “role model”—Amy’s fictional, after all. But watching White dramatize this process, which he has occasionally suggested is related to his own (he has told interviewers he had a similar breakdown in 2004), does inspire, at least a little. All those movies about the corporate whistleblowers and activists and their heroics, they seem so righteous, so convinced from the start that what they are doing is right and good. I mean, what they are doing is right and good. But the path to doing something that matters to a world wider than your own, well, it should involve a lot of self-questioning. Particularly if, like Amy, your day job ends up being more sinister than the banal, sunny corporate-speak that you’d been brought up your whole life to believe in. The premiere is tonight, on HBO, following Girls, wherever you are. For more on blockbuster progressivism, read Michelle Dean's take on the origins of Les Mis.